Real estate transactions and rentals at the north end of the island govern most of his days, but John Corcoran’s passion is training and competing with his retired Thoroughbred racehorse, Knightshade. 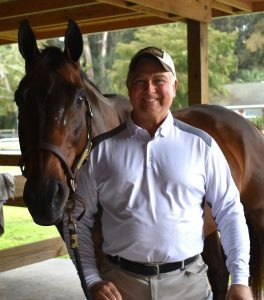 The BRC Group, LLC Realtor and Boca Grande Vacations rental manager rides Knightshade at least three times a week, and even more when he’s training to compete in an English Hunter/Jumper horse show. John has owned the 13-year-old horse for about eight years. Communicating only via touch and sound, John and Knightshade work together as one to create an ebb and flow of beauty and balance. John competes regularly at Fox Lea Farm in Venice. The owner of Fox Lea Farm, Clay Farrell, introduced John to his current professional horse trainer, Oscar Hernandez. John trains three times a week with Oscar at Gratton-Brown Equestrian Center in Bradenton. They developed a friendship and have been training together in Bradenton since last summer. John said he respects Oscar for his professional demeanor and his knowledge of riding and training. Knightshade was a Thoroughbred racing horse for years and then transitioned for one year with a different trainer to learn how to become a Hunter/Jumper horse. John competes in horse shows within the state of Florida. This past summer he won the Grand Champion Thoroughbred Hunters in his division at Ocala Hits in Ocala, Florida. His grandmother left Boca Grande as a teenager, and later, his parents reconnected the family to Boca Grande. John recalls visiting his great-grandmother in Boca Grande when the train was still running. He grew up in Park Ridge, a suburban town in New Jersey located just outside of New York City. His dad, Ray, started A-1 Delivery Service, Inc. a trucking and warehouse business in New Jersey in 1982. “My dad was a true entrepreneur who started with nothing and showed me that with hard work, building a successful business is possible,” John said. John and his siblings, Brian and Debbie, often helped out at their dad’s company, filling in wherever help was needed – in the warehouse, on the road or in the office. His mother, Iliene, worked as a dental hygienist and later joined the trucking and warehouse business. In 1989, his parents purchased a condominium in Boca Grande. They bought a restaurant, which was called Jams and is now Sister’s Restaurant, located at Fifth Street just east of Park Avenue. In 1998 the family decided to sell the trucking company and opened another Jam’s Restaurant off-island, which is now Villa Capri in Placida. After years of working in the restaurant business, John decided he wanted to do something different, and he earned his real estate license. Shortly after, his brother Brian earned his real estate license as well. They worked for different real estate companies for a few years and earned their Real Estate Broker Associate licenses. Brian, Broker/Owner, and John, Broker Associate, started The BRC Group, LLC in 2008 along with Sales Associate Dawn Havens. The BRC Group, LLC is a full-time real estate brokerage representing buyers and sellers and specializing in sales; Boca Grande Vacations specializes in vacation rental properties. Their father Ray, Broker Associate, also works at the office few days a week. competing in shows for decades. Speed is not favored in Hunter/Jumper classes. A steady but forward canter is favored by the judges, and a faster but steady gallop is used in Jumper classes. Growing up, John was enticed by the four horses at his grandparents’ farm in Alabama. His Aunt Diana and Uncle Brian and Uncle Doug were also very much into the horses. And the hobby continues to be a significant part of his life today. Before he had Knightshade, John and his former horse, Thor, participated in Western competitions for many years. Years ago, John would bring Thor to the island and ride him on the beach at the north end, before it became populated with residences. He recalls bringing Thor to Our Lady of Mercy Catholic Church on Christmas Eve to play a part in the live nativity scene. John’s parents still live in the area, and his sister, Debra Lynn Jungers, currently lives in Virginia. She is a retired major with the U.S. Army. Andrew Corcoran, 16, who is a sophomore at Lemon Bay High School. office at Boca Grande Vacations is located at the north end of the island at the Boca Grande North clubhouse at 6020 Boca Grande Causeway, just after passing the second bridge to the island. He sells real estate and manages unit rentals and boat dock rentals with the assistance of Dale Martin and Barbara Rajala in the office. To speak with John, stop by or call him at 941-716-4741, or send an email to john@mybrcgroup.com.